For approximately two years now the below picture is how we typically find Jack around the house. In a corner with a book. Sometimes on his head, the book upside down with him. Walking through the house with a book. At the dinner table with a book. In the car with a book. 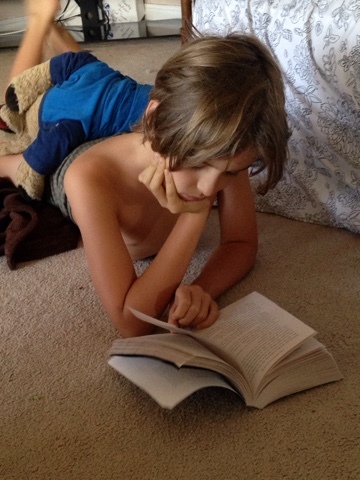 And rather than expound on raising kids who love to read (other than um, read to them, let them see you love reading...that's all I got) I figured I'd let him tell you about some books he loves. ME: First of all, who is the author? "Rick R-I-O-R-D-A-N. He also wrote Percy Jackson and the Magnus Chase Books. Percy Jackson is about the Greek gods and the Magnus books are about the Norse gods." ME: So you like books about mythology? "Yes. The Kane Chronicles are about Egyptian mythology." ME: So tell me about the books. "Well, the two main characters are Carter and Sadie. They are what they call Magicians, they use divine words and a wand and staff as weapons. Divine words are like spells you can cast. I'll give you a few of them. "Ha-Di" the destroying spell. "Hapi-u-ha-ey-pwah" conjuring a clay warrior for attack. "Se-kebeb" is a spell for freezing. There are three books in the series. I think they are good books. They are about Egyptian gods, Ra, Set, Bast and others. Sadie has a cat named Muffin who later turns into the goddess Bast, personally one of my favorite characters. I also like their mysterious Uncle who comes to get them from the House of Life, named Amos, also a magician. If you are a fan of Greek or Roman mythology it would be a good series for you. If you know Greek mythology you might know Tartanus, Duat is the Egyptian version where everyone slowly reforms, there particles spread apart when they die and then slowly come back after 100 or 200 years in a different form. All magicians and gods do this. And there are Chaos snakes and others. Now I'm going to tell about the storyline. In Book 1 "The Red Pyramid", is how they are normal kids until the fire god Set imprisons their dad in a sarcophogus and then their mysterious Uncle Amos comes to take them to the House of Life to train them. Another person named Zia thinks they are summoning gods and magicians oppose the gods so later they encounter her but her master thinks they are innocent so she lets them escape and then they are trying to oppose Set and free their dad. And then..."
ME: Wait, stop there. You don't to give away the ending! "Okay, Book 2 "The Throne of Fire" storyline is how Set becomes half good and Apophis the Chaos snake and god of chaos are trying to stop him from swallowing the sun and turning the world into chaos. They have to find Ra who is the only one who can stop Apophis. Book 3 "The Serpents Shadow" they found Ra, but he is kinda ga-ga, its kinda complicated how they are going to stop Apophis. His shadow is kind of disconnected, so if they destroy his shadow then they can destroy him. 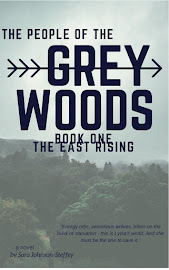 I think you should read this series, its good. 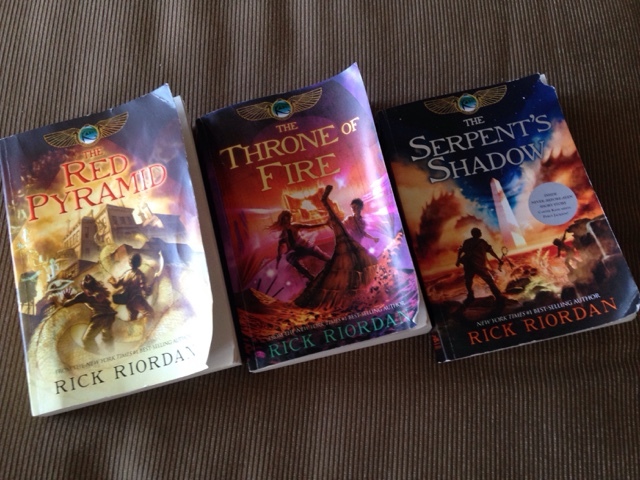 And other books by Rick Riordan. They are fun action mystery and drama books. Happy Reading!" You know those weeks. School feels like such a chore. Money is stressful. The holidays are approaching and you're going um, how are we paying for all this this year?? Then after awhile, you stop asking. And we have no farm full of grandparents and aunties and uncles to look forward to, for thanksgiving or Christmas, and ticket prices are expensive so no one is coming our way. And I for some moronic reason got so exhausted digging through our storage unit right before we left that when we couldn't find the Christmas boxes I thought to myself "it's OK, who cares, we will get some new ones in Hawaii!" And things are really expensive here. 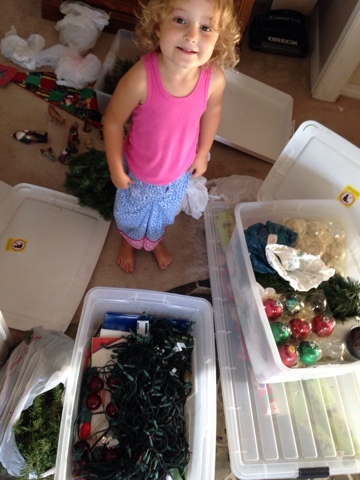 You can't just go out and replace 15 years worth of Christmas decorations. So I tried to be like June. I decided to go on to Pinterest and pin 47 million ornaments to make. With the kids. We made one batch of cornstarch/baking soda ornaments and I found myself snapping at the kids because they were doing them wrong. WRONG. So I kind of gave up. We would get a tree get some lights put up our little ornaments and call it done. And my extended family is texting each other about the Christmas decorations they are getting out and plans for the holidays and I'm thinking about our sad tree and feeling sorrier and sorrier for myself. And then to top of this week dada is trying to repair a leaky pipe. In the wall. In the rain. And so he goes to the attic, which we've never been up to, to investigate. And there. Lo and behold. The miracle. Tubs and tubs of Christmas decor, left by previous tenants, up for anyone to use. Can I say, I cried?! I mean. 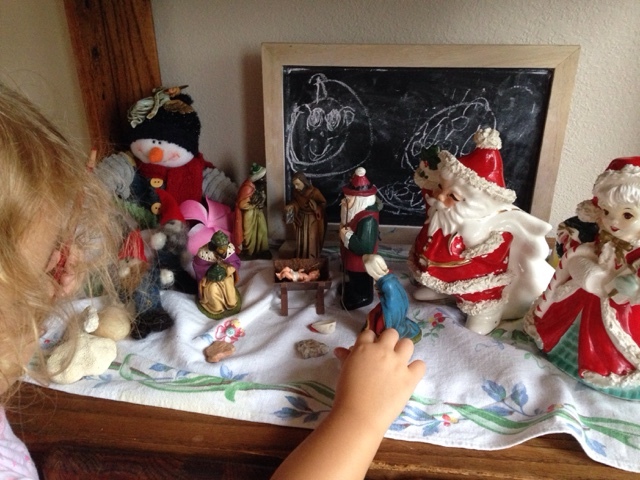 A nativity and some lights and garlands and a ton of glass balls and ornaments. Even a cheesy Santa vase. And I realize, okay so maybe God has a place for us here, so far from "home" (wherever that is). 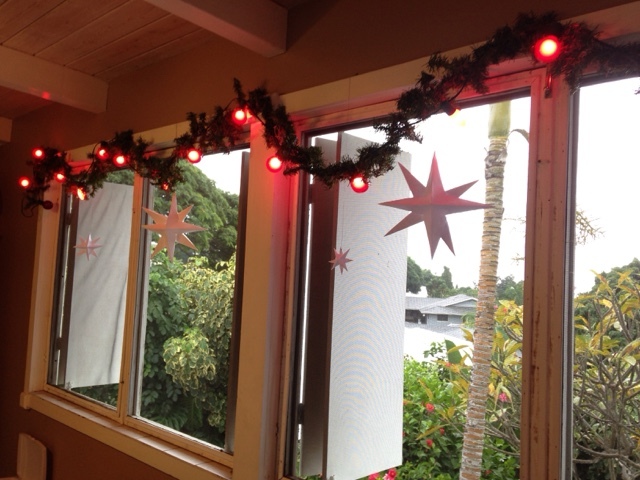 And as I put up the fake pine garlands, complete with paper stars we folded together, and strings of lights, I have to accept that it's okay to need the little things, things that seem so small. In a week of horrible tragedy around the world, tragedy in our dear city we left behind in the frozen northlands, it's okay to cry tears of joy over lights and Christmas balls. We can't let tragedy - or hard weeks - steal that joy. That gratitude. Joy over the little moments in life give us our humanity. Keep us tender. Keep us connected. We need to keep seeing them. Keep that wonder. His eye is indeed on the sparrow. And this mama is ever so thankful. 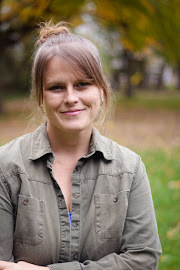 You know, its hard to juggle the working thing and the homeschool thing some weeks.But this week, for a few days at least, I feel like we got it. A few weeks ago little man discovered something about making a model volcano. But of course, I say, seeing as we live on the side of a volcano, we absolutely must do this. So we collected a bottle, some newspapers, and drew up designs and watched youtube videos. Meanwhile, we were at the library on campus the other day and little man says, out of the blue mind you, "I am going to look up a bunch of facts about volcanoes and then write a lecture for everyone and then do a presentation. So can you help me find volcano books?" I need more of this self directed study in my life man. How can this happen??? This morning, trying to prompt a similar enthusiasm I say, "hey, what do you want to work on today?" He says, "um. Nothing?" Maybe we arent quite there yet. He's got the bug. Its growing. Its just like fanning this tiny flame. Sometimes mama's enthusiasm can just extinguish it altogether. So, I'm learning too I guess. Learning how to learn. Yes. Anyway. Finally one day I said, okay guys, lets build. We started with a bottle on a rusty old cookie sheet, then covered it with random bits of cardboard all taped together. This forms the base of the volcano. Then I mixed a handful of flour with water to form a paste. We cut strips of newspaper. The girls refused to do the paste part. Too messy. Instead I put on a Magic School Bus episode about chemical reactions in baking. Baking soda! Vinegar! Bubbles! That is what we are going to do! See?? In the hot Hawaiian afternoon sun it took about a day to fully dry. After that we waited a few days. Needed to go buy paint, seeing as I left all my craft goodies in a storage unit in the frozen Northland. Finally. Painting day. We added little streams of lava down the side for effect. Little man's idea. So, this week, finally finally. Explosion day. We watched a video about the Mt. St. Helen's explosion and the kids wrote up presentations (Little Green drawing a picture). They gave their presentations and then EXPLOSION. I liked doing it over the period of a few weeks and I am thinking we will continue science this way over the year. Next is ocean study, so I am thinking find an experiment to plan and research.Write up reports along the way, watch some videos on the topic, read some books, then on the big day we do our reports and the experiment. Okay. Anyway. You've got to celebrate the minor accomplishments in motherhood and this felt like one. Science! Engaged! Learning! Fun!